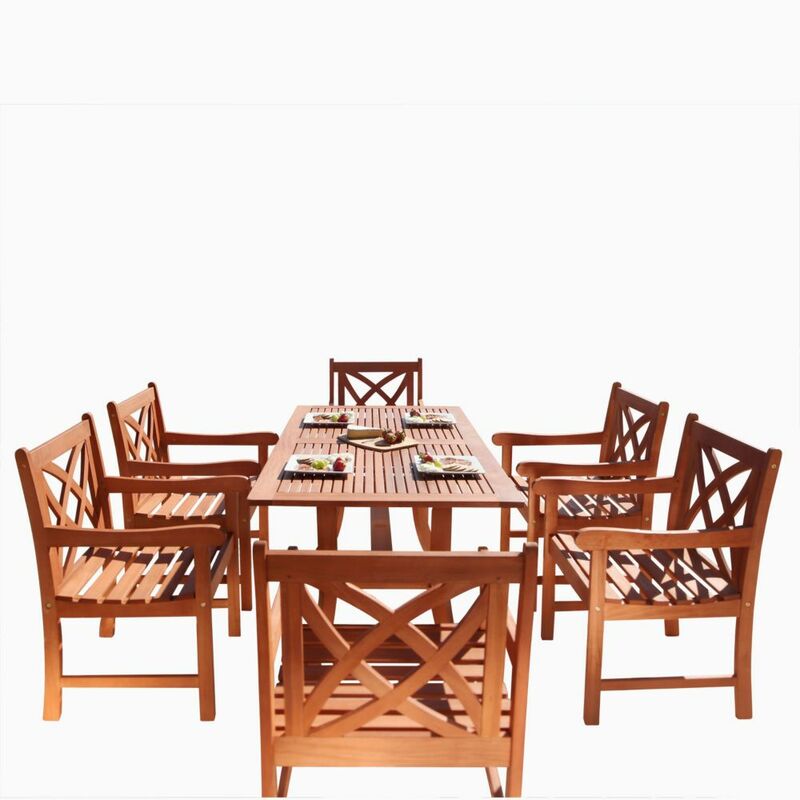 Relax in style with this comfortable 7pc dining set from CorLiving. The sleek lines and powder coated aluminum frame of the PJR-572-Z2 create an elegant look, while the wide slat surface offers a comfortable seat. Constructed from durable engineered polymer material, this set has the appearance of bleached wood without the necessary upkeep and is UV resistant which prevents discoloration. This set is expertly constructed to withstand a range of climates. Malibu Outdoor Patio 7-piece Wood Dining Set with Curvy Leg Table Make way for dinner parties, idle summer cocktails, and the optimization of fresh breezes to come with this Malibu Outdoor Patio 7-piece Wood Dining Set! Made from 100% Eucalyptus - a very durable Hardwood, this set that can stand up to all kinds of changes in the weather. The pores of the Eucalyptus is very dense; thereby it quickly repels water, and its natural oil combats and repels wood eating insects. Comes in the beautiful Natural Wood Finish, this set will be a great addition to your outdoor patio! Malibu Outdoor Patio 7-piece Wood Dining Set with Curvy Leg Table is rated 4.3 out of 5 by 4. Rated 4 out of 5 by Phyllis from It looks really nice. It was easy to assemble.... It looks really nice. It was easy to assemble. We are adding a coat of poly before we set it under the sun. Looking forward to using it. Rated 5 out of 5 by cholasu from Beautiful and easy to assemble. Just wish it came with an umbrella. Beautiful and easy to assemble. Just wish it came with an umbrella. Rated 4 out of 5 by pctHIKER from have bought this set for many years. light annual stain keeps it looking like new on the deck of... have bought this set for many years. light annual stain keeps it looking like new on the deck of my hostel in Mammoth Lakes. seat cushions easily bought locally.